Laurie Strode: Molly please, do you have any thoughts on Victor and Elizabeth? Molly: Well, um, well I think that Victor should have confronted the monster sooner. He's completely responsible for Elizabeth's death because he was so paralyzed by fear that he never did anything. It took death for the guy to get a clue. Laurie Strode: And why do you think he was finally able to confront his monster? The decapitation at the end of the movie. It cuts to the credits and Halloween music right after she swings the axe. The scene of Michael getting pinned by the van against the tree has been cut out. It cuts to the van catching on fire. This becomes a goof though, as when Laurie looks at the van, there is no fire, but it starts up again. The sequence where Laurie is driving down the road with Michael in the body bag in the back has been lengthened. It uses some shots of the van driving down the road twice. The scene where Michael chases after John and Molly cuts out the shot of the knife going into John's leg when Michael stabs him. Will's death has been edited. 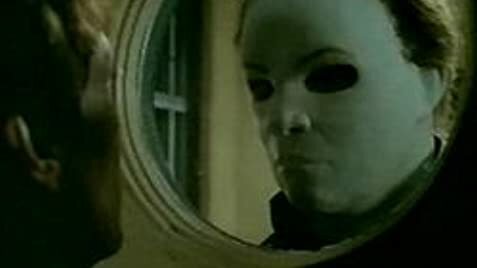 It only shows Michael go up behind him, then cuts to a shot of Laurie looking at him. His body is then thrown down on the floor. Scenes with the f-word and/or s-word have been dubbed over, or taken out completely. A Division of Sony Music Corp.
Q: What happens to Laurie's son John?